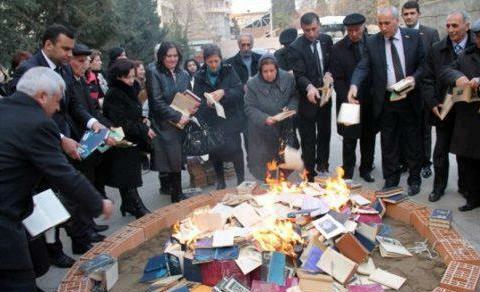 Books of Akram Ayisli being burnt in the city of Ganja. Azerbaijan chose the week in which it launched its first communication satellite into space to crack down on a writer who dared challenge the official narrative of history and relations with Armenia. Observers could not fail to notice the irony that whilst the space launch was being hailed as an example of Azerbaijan’s success as a modern state the burning of the books of Akram Ayisli and threats by a pro government politician to put up a prize for the author’s ears, sounded more like medieval acts of intolerance. Akram Aylisli was last week officially stripped of his “People’s Writer” title and his presidentially awarded pension. He was also expelled from the Union of Azerbaijani Writers. The actions were taken because of Aylisli’s novel “Stone Dreams,” published in a popular Russian magazine last year. It focuses on clashes between Azerbaijanis and Armenians in Baku and Nagorno-Karabakh in the 1990s and challenges stereotypical characterisations that have been part of the official narrative of events. “Spontaneous” public protests against Aylisli and rituals in which Ayisli’s books were burned have now been followed by a bizarre offer by a pro government politician to pay a prize of 10,000 manats (around US$12,700) for the ear of Ayisli. Aysili is now saying he is considering leaving the country because he is afraid for his life. A bad week for free speech in the South Caucasus.